We have our first reliable Pixel 3 rumor of the year. A report from Bloomberg claims that Foxconn will be the manufacturer for the Pixel 3 and details several aspects of the phone's new design. Over the weekend, Android sites were buzzing about a smartphone screen-protector leak from the depths of China's Twitter-like Weibo social media service. We opted not to publish the leak because it was totally unsourced—no one was vouching for its authenticity. The new details from Bloomberg's report line up with the screen protector though, making it seem like a legit item. First up: the manufacturing news. Bloomberg says Google is again planning a "Pixel 3" and "Pixel 3 XL," and just like Apple, the phone will be made by Foxconn. This implies the phone is more of an "in-house" job than Pixel devices in the past, since the Pixel 1, 1 XL, and Pixel 2 were all made as a collaboration between Google and HTC, while the Pixel 2 XL was made with LG. Earlier, Google made a $1.1 billion deal with HTC and one of its smartphone design teams, which consisted of 2000 employees. Bloomberg's report says this team is "heavily involved" in the development of this phone. That deal only closed in January, so HTC's former team hasn't been around long enough to do a top-to-bottom in-house design, but they have apparently been around long enough to not need to involve an OEM like LG or HTC. Next, Bloomberg gives a description of the phones, and be sure to mentally check off features from this weekend's screen-protector leak, shown above. The report says the Pixel 3 XL has a "nearly edge-to-edge screen, except for a thicker bezel known as a chin at the bottom of the phone. The display also will have a notch—or a cutout—at the top." The report says the notch "won't be as wide as a similar feature on the iPhone X, but is noticeably taller." The Bloomberg report also explains the two large holes inside the notch, saying "the bigger Pixel will include two camera lenses on the front of the phone." Interestingly, the report says there will still be only one camera on the back, even though there are now two in the front. As for the smaller Pixel 3, again Bloomberg's report lines up with the screen protector, saying "the smaller model will look similar to the Pixel 2 and won't include the notch or edge-to-edge look." While the alleged Pixel 3 screen-protector leak also shows it with two large holes for dual front cameras, Bloomberg does not vouch for that aspect of the leak. With Bloomberg and the screen protector both pointing to the same design aspects, we can get a better idea of what the final phone might look like thanks to @PhoneDesigner on Twitter. 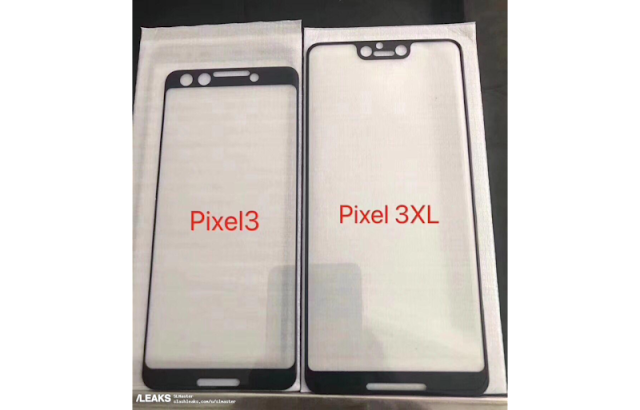 Using the screen protectors as a base, the user made speculative renders of what the Pixel 3 and Pixel 3 XL might look like. Of course, the sides and backs are purely up to the artist's imagination, but it's hard to go wrong with the front design if you have a screen outline to work from. Bloomberg pegs October for the release date, with Verizon Wireless again being the "exclusive" carrier partner in the US. We even get a tip about a future Pixel phone, with Bloomberg saying "Google aims to eventually remove the bezels completely in a future Pixel but is retaining the notch and chin this year to keep stereo speakers on the front of the phone." There are still lots of questions here. What's the reasoning behind two cameras in the front but one in the back? In keeping with Google Hardware's need to follow Apple's lead, will the front camera be used for some kind of Face ID-like biometric system? What about the fingerprint reader? Will it be on the back, or will it use one of the new in-screen fingerprint readers we keep hearing about? The Pixel 2 introduced us to the Pixel Visual Core, a Google-designed SoC for the camera, so will the Pixel 3 include some new custom Google silicon? The screen-protector leak and Bloomberg both claim the Pixel 3 XL will have a large notch, and it certainly looks large enough to require a distorted, larger-than-normal status bar, like the Essential Phone. That would put the design behind companies that have figured out how to make a notch small enough to fit inside the normal status-bar height, like LG and OnePlus. Falling behind the other hardware manufacturers would be typical of Google's Pixel line. The Pixel 1 and 2 weren't the best hardware of their generation, but they did have the best Android software. It looks like the Pixel 3 will be following suit. 0 Response to "Google Pixel 3 will reportedly be built by Foxconn, have a massive notch"